A new film about the hunt for Osama Bin Laden is “inaccurate” for suggesting torture helped lead to his discovery. That is according to three US senators who outlined their objections to Zero Dark Thirty in a letter to the head of Sony Pictures Entertainment. Kathryn Bigelow’s Oscar-tipped drama, their letter claims, is “perpetuating the myth that torture is effective”. In a statement, Bigelow said her film depicts “a variety of controversial practices and intelligence methods”. According to the director and Zero Dark Thirty screenwriter Mark Boal, no single method was responsible in the successful manhunt for the terrorist leader. The letter, made public on Wednesday, was co-signed by Dianne Feinstein, Carl Levin and former Presidential candidate John McCain. The trio, all of whom are members of the Senate Intelligence committee, said that Sony and its CEO, Michael Lynton, had an obligation to alter the movie. “The fundamental problem is that people who see Zero Dark Thirty will believe that the events it portrays are facts,” the three senators wrote. The senators said the “use of torture in the fight against terrorism did severe damage to America’s values and standing that cannot be justified or expunged”. The makers of Zero Dark Thirty, they went on, had “a social and moral obligation to get the facts right”. 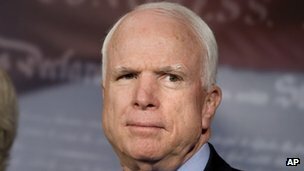 “I’ve watched the film and I can tell you there’s no doubt the impression that you get from the film is that waterboarding did elicit information… that was instrumental,” Mr McCain told the BBC. Mr McCain said he would “like to have them to make a statement that some of this depiction is not factual in a very important way… it’s not just a side aspect of it”. Earlier this year Bigelow’s film was accused of being a propaganda tool intended to assist President Obama’s re-election campaign. The release of the film was subsequently put back until after November’s election. It was also claimed Boal, who previously worked with Bigelow on Oscar-winning drama The Hurt Locker, had been granted access to classified information, an allegation he denied. The film, which has been nominated for four Golden Globes, is released in the UK on 25 January.